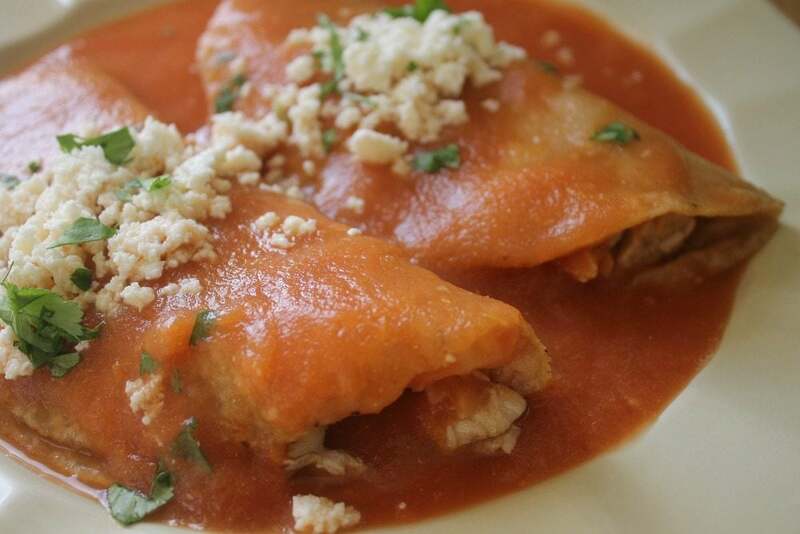 Entomatadas de Pollo (Chicken Entomatadas) is a tasty and easy Mexican recipe. 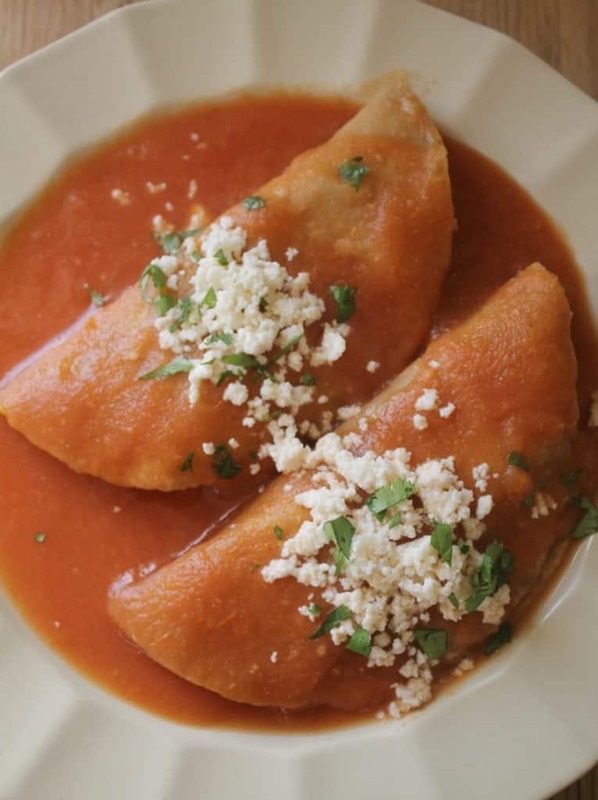 It’s made with fried tortillas stuffed with chicken and drenched in a savory tomato sauce. You know when everyone wants something different for dinner? I HATE THAT! That’s why I love this dish. 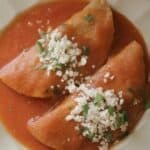 I can make it with chicken for the meat-loving, carnivore family members, or meatless with cheese for me. Everyone is happy, and that makes for a happy cook! Now, time to fry the tortillas. 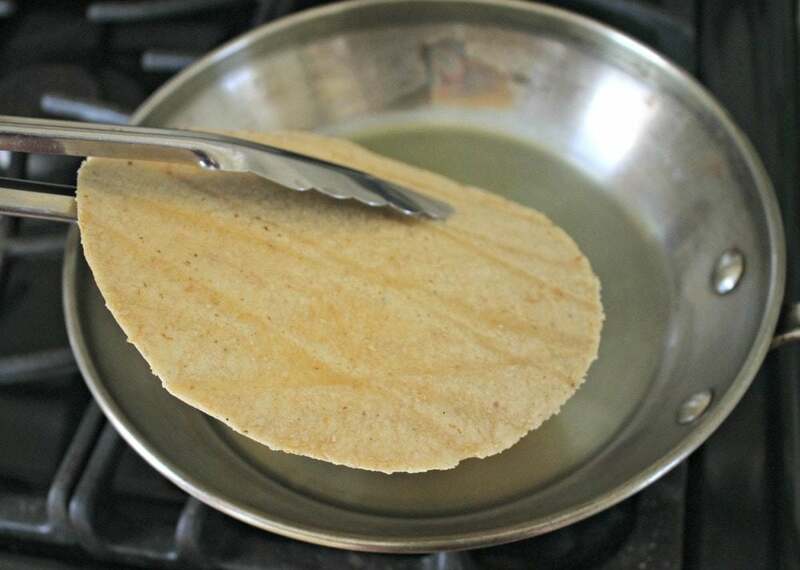 If you don’t want to fry because of the smell or because you’re trying to watch your figure, try brushing some oil on the tortillas. Then warm them up on the griddle. Dip the tortilla in the red sauce. Then fill them up with leftover chicken. I always make extras for just this reason. It’s great use of leftovers. Top with more sauce, crumbled queso fresco, and a few slices of avocado. Hope you enjoy! In a stock pot, add tomatoes, jalapeño, onion, garlic, and water. (Add enough water to cover everything). Add everything from the pot to a blender. 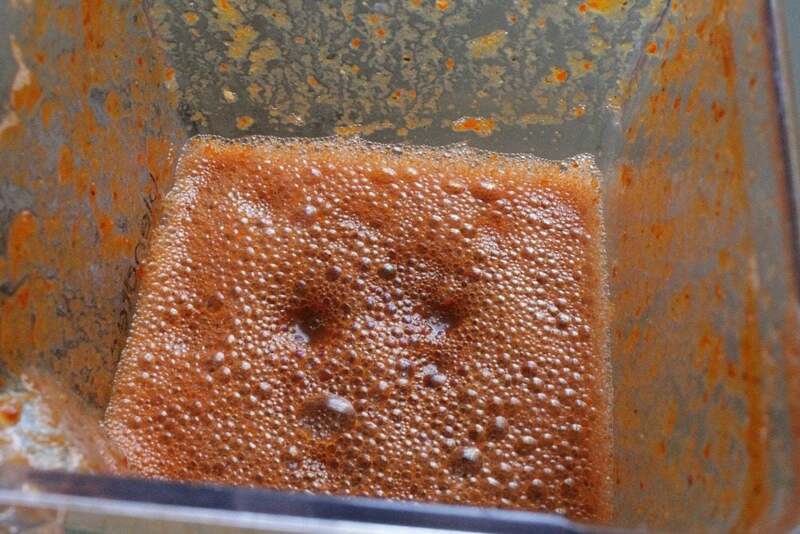 Add salt and cumin to the blender. Pour salsa into a deep plate. 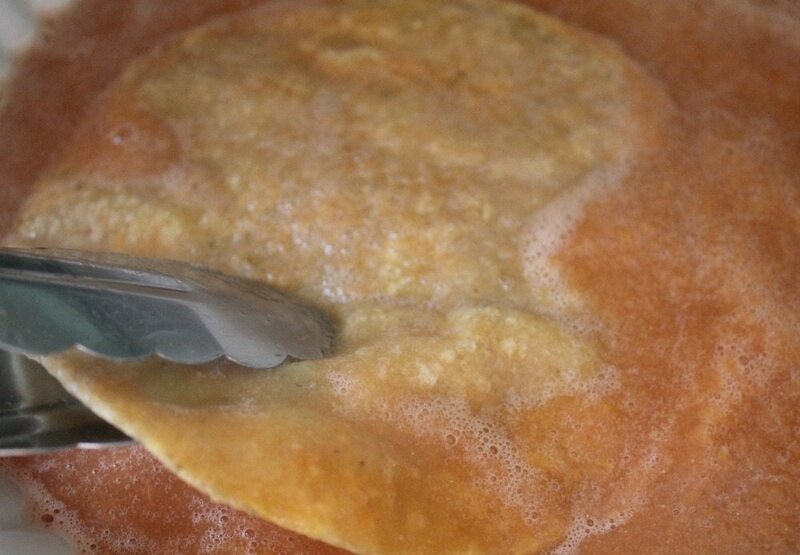 Fry each tortilla individually for 1 minute on each side. Place on a paper towel to drain any excess fat. Dip the fried tortilla in the salsa. 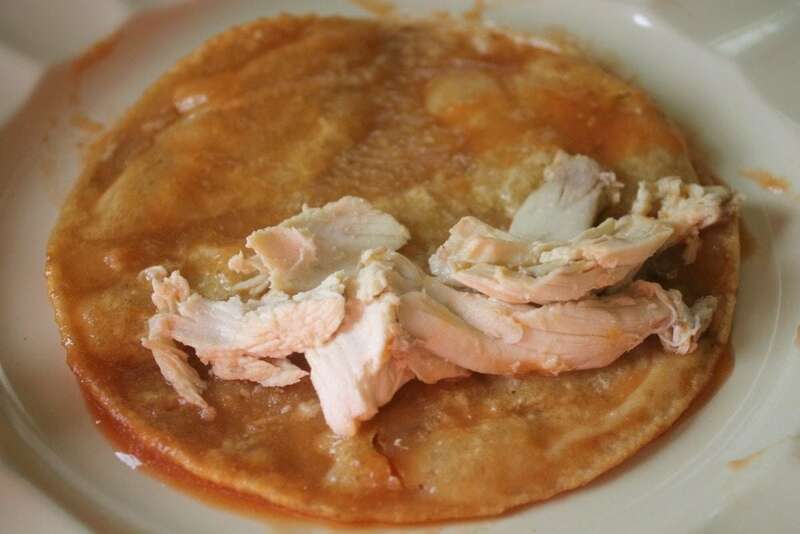 Place the tortilla on the serving plate and fill with a few pieces of chicken. Fold over the other side of the tortilla. Repeat with each tortilla until done.